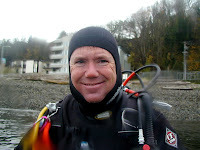 Seven Tenths Skooba Pacific Northwest Diving, diving instruction, technical diving and just plain ol' getting wet with Ken Pfau PADI Dive Instructor and Technical Diver. 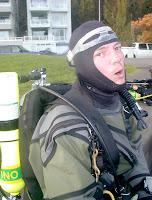 Learn how to be a better Scuba Diver, join us for some adventurous diving trips and check out some cool swag. This weekend we completed our open water checkout dives for a small but dedicated group of divers. Dave, Ragan, Christian and Brad all braved the chill and at times a little rain on the beaches of Alki. 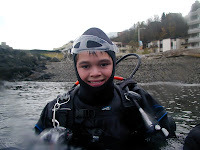 Christian had his special 14th Birthday treat as his dad tried to sing “Happy Birthday” underwater. Somehow it didn’t come out quite right because Christian thought dad needed to “share air” when he heard the gurgling and bubbling and was ready to give away his alternate regulator. So Christian had to wait until our surface interval and was treated to a special birthday doughnut. 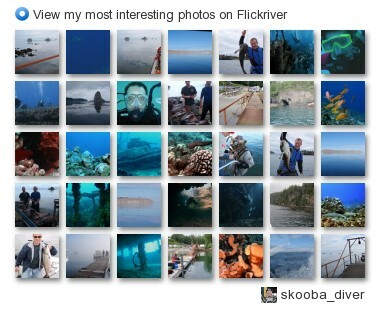 The water conditions were great; we had almost 30 feet of visibility and refreshing 52 degree water. Plenty of exciting sights as well; and although we didn’t catch sight of any octopus we were treated to numerous nudibranchs, sun stars, ling cod and multitudes of crab. 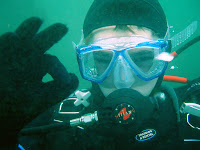 Brad took advantage of the new Discover Nitrox Today program and enjoyed dives 3 & 4 breathing a nice rich 32% oxygen mix. While there isn’t much to notice in the way you feel, there was a big difference in the planned dive times or surface intervals.